For the first time, Diddy Kong is joining the brawl! 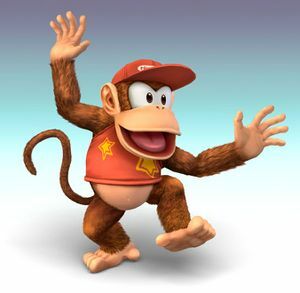 Diddy Kong is a lightweight, which means he is very agile and very fast. His attacks a quick and has good power to back it up. He can also wall cling and wall jump AND crawl. However, he has trouble KOing since his smashes aren't really powerful, especially when stale. Diddy Kong has two very reliable projectiles, his Peanut Popgun and his banana peels, making him great at long ranged combat. However, due to the nature of his playstyle, you would want to stick with flat-plat stages such as Final Destination as Diddy Kong generally does better there. Diddy Kong's ground game is pretty good. His jab is nice for a little damage and his dash attack can pick up items safely while damaging opponents. His Strong Side is good for knocking opponents away. His Strong Up and Strong Down are great jugglers, so use them early on in the match. His smashes are mediocre, however. His Side Smash has the strongest knockback, but its hard to land and bad if missed. His Up Smash can be used to damage rack, but it's not good at KOing. His Down Smash is what you should be using for KOs. Remember to save it until the end of the match and use it at an opponent who tripped on a banana peel. His grab game is average. His pummel hits almost instantaneously. His throws are mainly for racking up damage and occasionally, KOing. Diddy can fight very well in the air. His Neutral Air is another good damage racker. His Up Air and Back Air are decent, while his Down Air is for meteor smash KOs. His Forward Air is Diddy's strongest aerial attack and will be the main move you use for aerial KOs. Diddy Kong's known for his Specials. His Peanut Popgun is good as a projectile. You would generally want to shoot it uncharged, as a charged peanut moves straight and is easier to dodge. The peanuts are very frail, however. One hit is enough to destroy them. The peanuts can also be caught and thrown back at you as items. Use Monkey Flip a lot as it can be used as an attack or as a grab, and it deals pretty good knockback. Your Rocketbarrel Boost is your main form of recovery. However, it is easily intercepted during charging and hitting a ceiling during flight will render you helpless. His bananas are definitely the stars of his moveset. He can spawn a maximum of two bananas, which can be used in a variety of ways. He can use them as a much faster projectile, leave opponents vulnerable to his attacks, damage rack, and set up traps around the stage. Note, however, that the bananas can be caught by other characters and be used against you, so try to get control of these bananas. Smart banana play is fundamental in any Diddy's playstyle. If you're not using this move, you're not going to win much. A False Diddy Kong copied from the shadowbugs. Somehow, a False Diddy Kong has been copied by the shadowbugs in the Subspace Emissary when bowser first shot him into a trophy and he grew into a giant False Diddy Kong making it to where he could battle with Fox, Falco and the real Diddy Kong. Monkey Combo Punches twice, kicks once and whips it's tail. Press the attack button to continue this attack infinitely. + + + + Arm Thrust Diddy Kong leans sideways and thrusts his two hands. + + + + Primate Swipe Swipes upwards. + + + + Monkey Clap Claps at the ground. This move comboes into itself at low percents. while dashing while dashing while dashing while dashing Grouded Cartwheel Diddy does a cartwheel. Smash + + + (Smash + ) or (Smash + ) or Spinning Punch He punches twice while spinning. Smash + + + (Smash + ) or (Smash + ) or Strong Cartwheel Diddy kicks upwards three times. Smash + + + (Smash + ) or (Smash + ) or Monkey Breakdance Performs a sweeping kick. Diddy's most reliable smash attack. after grab after grab after grab after grab Headbutt Diddy headbutts the opponent. Hits very fast. after grab after grab after grab after grab Frontal Throw Tosses opponents forwards. Diddy's strongest throw. after grab after grab after grab after grab Behindular Throw Throws opponents backwards. after grab after grab after grab after grab Kick Up Diddy kicks his opponents upwards. after grab after grab after grab after grab Leap Monkey Throws opponents down while doing a leapfrog-like movement. Aerial Cartwheel Does an aerial cartwheel. + + + + Monkey Kick Kicks forwards. Diddy's strongest aerial. + + + + Back Kick Kicks backwards. + + + + Monkey Pound Punches downwards with his two hands. Peanut Popgun Hold the proper attack button to charge this attack. If you overcharge it, the peanut popgun will explode, briefly rendering Diddy immobile. When Diddy holds his hat, it's time to fire. + + + + Monkey Flip Diddy leaps forward, latches on to his enemy's face, and then karate chops the victim before jumping off. Alternatively, one can press B or A during the move before hitting the enemy to turn it into a flying kick. This attack can be useful for a horizontal recovery. + + + + Rocketbarrel Boost The longer you hold down the input button, the farther he flies. 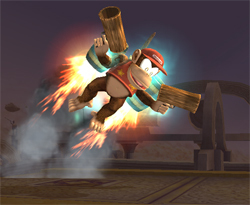 The rocketbarrels will go flying haphazardly if Diddy gets hit while charging. + + + + Banana Peel He tosses a banana peel behind him. If you step on it, you'll slip and fall. This move is very useful as it can limit opponents movements. Try scattering them around the stage to force them in to fighting you. He takes off his hat and throws it back onto his head. + ( or )+ or or He assumes a kung-fu stance. + He dances, clapping his hands above his head. Rocketbarrel Barrage: Diddy takes out his Peanut Popgun and Rocketbarrels and starts flying above the stage, firing peanuts straight down unless you tilt Diddy right or left to change the firing angle. When time finishes, the Rocketbarrels will explode, damaging your enemy a little. The peanuts that don't hit an enemy can be taken as food to recover some energy, so be sure to hit with all peanuts because your enemy can also take the peanuts and gain life instead of losing it. This page was last edited on 21 December 2018, at 03:20. This page has been accessed 30,846 times.